Okay, the title is a bit misleading. There is nothing especially easy about starting a private practice. But, there is definitely a "hard way" and "easier way" to go about it. The hard way involves stumbling through the process yourself, learning through mistakes. Lots of mistakes. Insurance companies don't provide a "Intro to Insurance for Dummies" (though they should!) If you haven't worked in an agency that bills to insurance (which I had not) the process of learning the lingo of insurance is like learning a foreign language without a textbook. The following is a list of steps you'll need to go through to start your private practice. If you plan to bill insurance, you'll have to follow all the steps. If you don't, there will be some you can skip. While I tried to put the steps in order of needing to do them, some of the tasks have kind of a "chicken or the egg" quality to them. For instance, while it's logical to sign up for insurance before taking the step of securing a practice location, the process of applying for insurance requires a business address. The process can get a bit overwhelming and you may wonder if it's worth the trouble to jump through all these hoops. I will say, once you're through the hoops, things get a lot easier. By the time you've been in private practice 6 months, you will feel much more confident. Step 1: Be sure you're ready for private practice. If you've just finished your professional degree, I'd strongly suggest working in a mental health agency or, at the very least, a group practice. Working in solo practice is isolating. It's important to have colleagues with whom you can consult about cases. This is especially important in the early years of your career. Step 2: Consider Increasing Your Malpractice Coverage. I assume that you have a malpractice policy that covered you during your training and your work at previous sites. If not, you definitely need to get malpractice insurance. The Trust is a solid company to choose. How much is enough coverage? Consider the assets that you may need to protect. If you're not sure, consult with a lawyer, with your own licensing board, with your professional organization or with your malpractice insurance company. Step 3: Decide on a business structure. While it's possible to operate your private practice under your own name without creating a business structure, you risk more should you ever be sued for malpractice. Many solo therapists run their business as an LLC. Running your practice as an LLC can help protect you, should you be sued. Setting up an LLC is relatively easy. You can just set up your LLC through your state's business registry. Here is the link for the registry in my home state of Kansas. You may want a lawyer to set up your business structure for you. In my area, that process runs $700-$1000. It's especially important if you plan to open a partnership, since the documents drafted would protect you should your partnership dissolve. If you've never run a business before, you may feel really unsure about how to structure your business. There are some good online resources that can help, but nothing is more useful than consulting with a good accountant. Even if you decide to do your own taxes, it's really useful to have an accountant to talk to about business issues. Step 5: Choose office space. Are you planning on being full-time in private practice or part-time? Either way, it may make sense to start your practice by sharing office space with another therapist. This keeps your cost down while you're working to build up your practice. If you're sharing space, be sure to ask around to ensure that you're paying a fair amount for the space you're using. If you're renting, or buying, your own space, consider how much you can afford monthly. Ideally, you'll want to keep your overhead expenses at less than 10 percent of your income. Of course, if can be hard to know, in advance, how much you can expect to earn. It's a good idea to network with other therapists in your area who have your same credentials to ask them about issues like budgeting. Regardless of what you decide, having your business address is an important part of this process, as you will need a business address to move forward with the process of being credentialed by insurance agents. Step 5: Decide about taking insurance. If you search on the internet, you'll get the idea that "good therapists" don't take insurance. I've also heard "I'm a specialty psychologist. I don't take insurance." In my view, it's not about whether or not you're highly skilled or a specialist. It's about where you live. Therapists in affluent areas can more easily get away with not taking insurance by catering to privileged clientele. In many parts of the country, there are too few people affluent enough to private pay. The other consideration is ethics. As a specialty psychologist myself, I don't feel like it would be ethical of me not to accept insurance. If I didn't accept insurance, I would be placing an unneeded burden upon those who really need specialty care. I think this is especially important in my specialty, perinatal psychology. Mothers who are pregnant, postpartum or who have lost a baby have likely paid thousands of dollars in medical care and have met their insurance deductible. I would not feel good about asking them to pay me privately on top of all their other expenses. But, in the end, the choice is up to you. If you don't accept insurance, you have the freedom of not needing to formally diagnose your clients. You can set your own fees or even run a sliding scale. You don't need to feel worried that the insurance company might question or limit the amount of sessions you're providing. There are definitely benefits to it. If you're not going to take insurance, go ahead and skip to Step 11. If you do want to bill to insurance, take heart. It's easier than it's ever been before. Using an Electronic Health Record (EHR) makes the process seamless (once you get it set up!) See Step 11 for more info. Step 6: Obtain your National Provider Identification (NPI) number. Your NPI number is your ID number as a therapist. You'll need it all the time when interacting with insurance companies. You apply for it here. The application asks for your business address. Step 7: Fill out the CAQH. The CAQH (which stands for Council for Affordable Quality Healthcare) is an organization that collects and maintains all the information that you need to be credentialed by insurance companies. It's a beast of a form. Gather up all your college transcripts, information on your training sites, your licensure information and malpractice insurance policy (a digital copy will need to be uploaded.) You even need things like the physical address of the universities that you attended. So, grab yourself some snacks and a hot beverage. It's going to be a while before you're done with it. After you're finished, you'll have to reattest your CAQH every quarter. That seems burdensome, but you may find that you catch small changes that you've made (e.g. a new phone number.) Fortunately, CAQH e-mails you a reminder about the need to reattest. Step 8: Get Credentialed. The process of being accepted as an in-network provider on insurance panels is called credentialing. It can be a tedious process that involves applying to each insurance company and retyping much of the information that you already put on the CAQH. Knowing that the insurance companies have access to your CAQH will, undoubtedly, make you puzzled about why you have to retype this information into yet another form. Don't let this raise your blood pressure. Just get more snacks and another hot drink. Take some deep breaths and tell yourself: this too shall pass. Or, easier yet, hire a billing professional to handle your credentialing for you. Billing professionals used to be a nearly essential part of running a practice. However, with newer, electronic claim filing, many therapists are doing their own billing. However, if you plan to take multiple insurance plans, hiring a billing professional can make your life much easier, especially during the credentialing process. You can find ones that bill a flat monthly fee. Most that I've heard of bill per claim. I've heard amounts from 5-9% mentioned by colleagues who use them. Step 9: Learn the Billing Lingo. In graduate school, you learned the clinical lingo of diagnosis, but if you haven't billed to insurance, you have more to learn. In order to file a claim with insurance, you will need more than an ICD-10 diagnosis (your EHR, if you use one, will have the DSM-5 and ICD-10 diagnosis codes integrated into the notes program.) You will also need to use a CPT code. CPT stands for "Current Procedural Terminology." A CPT code indicates the type of service that you are providing related to a given diagnosis. For instance, if you do an intake interview, it is a CPT code 90791. Most CPT codes for therapists are tied to the length of service, such as the common 60-minute Psychotherapy code 90837 or 45-minute Psychotherapy code 90834. You can get a list of common CPT codes here. The diagnosis and CPT code, along with the date of service, your NPI number, practice information and the client's name, address, date of birth and insurance information all go onto a visually complex looking form called the CMS-1500. 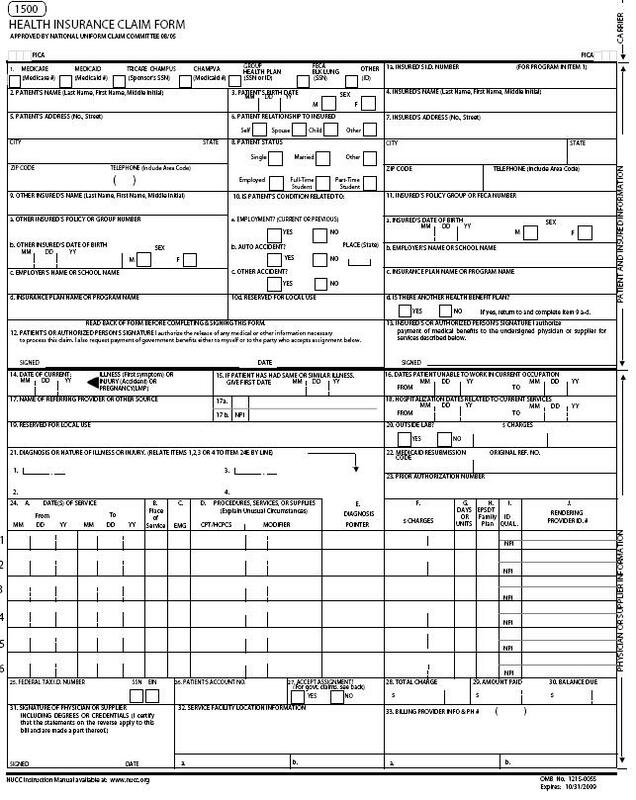 The CMS stands for "Centers for Medicare and Medicaid Services" The 1500 stands for the number of sections on the form. Just kidding. It only feels like there are 1500 sections. Just looking at the CMS-1500 makes my heart glad that my Electronic Health Record (EHR) fills out this form for me, with just a few clicks. How does it do that? You enter all your practice information into your EHR when you sign up. When you get a new client, they enter all their personal and insurance information into your program (at least, that's how it works on my EHR.) After intake, you enter the diagnosis and service code. A few clicks later, the CMS-1500 is complete and sent off to the client's insurance company. After each session, you will send off another CMS-1500 to the insurance company specifying the service you delivered that session. One caution on diagnoses: insurance only covers diagnoses that are thought to be health conditions, not life transitions. So, you can't bill for something like "Bereavement" or for "Parent-Child Relational Problem." You must justify that you a providing a service that is medically necessary. If the symptoms of a life transition are sufficiently disruptive, you may be able to bill the client as an Adjustment Disorder, a diagnosis which is accepted by insurance. Before agreeing to bill to insurance, you will need to let you clients know that not every condition is covered by insurance. For instance, couples counseling for normal relationship discord is not covered. However, conjoint counseling may be covered if you are treating a disorder in one partner and the other partner is there to help in that treatment process. Step 10: Learn the Rules of Billing Insurance (aka Avoid Committing Insurance Fraud.) When you contract with an insurance company, you agree that you are not charging them any more than you are charging anyone else. They want to know that they have your best rate. So, this means that you cannot slide your fees for other clients without insurance. Oddly, the different insurance companies offer a different rate of compensation. For some reason, all you need to do is to charge every insurance company the same. It is acceptable for you to receive a lower rate of compensation from another company. Unfortunately, you cannot charge a private pay client any less than you'd charge the insurance company. Nor can you ever "waive" a copay or other patient responsibility in billing. That would be considered insurance fraud. What do I do about this? I set my rates no higher than the best paying insurance company gives. That means, at the very least, that I'm not charging private pay clients more than I'm charging insurance. While I cannot slide my fees for clients, I do offer payment plans. In that plan, I would agree to a certain amount paid at each session (perhaps half of my fee) and agree to a time frame for paying off the balance. While you must charge everyone the same and you must make a real effort to collect your fees from your clients, you are not forced to use a collections agency. If, after a period of time, you feel you have made a good faith effort to collect the balance, you are able to write off any unpaid remainder for your private pay clients. What I would not suggest doing: Do not just tell people "oh, pay me when you can." Therapy charges can add up quickly. A large, unpaid balance can become an issue in the therapeutic relationship. Instead, consider what the lowest amount is that you would find acceptable to receive for your services. Collect that at each session. Make a plan for the rest. Step 11: Choose How to Keep Records. While it's now required that you submit your insurance claims electronically you can still keep your records in any format that you wish (paper, Word document, electronic health record.) Most people are choosing to use an Electronic Health Recorder (EHR.) EHRs enable you to work online, so you can work from home or your office. They use bank-level encryption to protect your records. They let you bill directly from the EHR, often with just one click. Other features may include allowing client's to self-schedule, sending e-invoices, and receiving payment online. There are several options on the market and surely will be more to come. I'd recommend narrowing it down to two or three and looking at each in detail. Most have a free trial period that lets you check out the features in advance of committing. Some well-known ones are Therapy Notes and Therapy Appointment. My personal preference is for Simple Practice. Newer than the others, and lower cost, Simple Practice provides a wide range of services including sending out intake questionnaires and consent forms prior to the first appointment, integrated one-click billing and invoicing, and an easy to use patient and payment portal. It even has an "autopay" setting where you can, with your client's consent, set the program to bill your client's credit card (or Health Savings Card) after each session. These tools help you collect your payments promptly, which you'll find is an important part of surviving in private practice. Simple Practice also tracks your payments as they come back in, helping you see when you're paid, both by insurance and by your clients. I love the ease of Simple Practice. I know other therapists who swear by their own EHR. I would just say to choose carefully. While it's possible to switch your records from one system to another, it's a hassle. Most likely, you'll want to stick with one program. Step 12: Develop Record Keeping Templates. Every insurance company you contract with will have a list of essential elements that they will be looking for should they audit your records. Whether or not you decide to submit to insurance, keeping your records in a tidy, timely and thorough way will protect you and help you better serve your clients. At minimum, your records should include: the stop and start times of the session and session length; information on mental status, mood, affect, social and cognitive functioning; symptoms; progress since the last session; therapeutic interventions provided, any updates to the diagnosis or treatment plan; changes to medication; and your follow-up plan. If you're keeping a paper file, you should sign your note. If you're using an EHR, you need to "lock" the note to prevent editing as a way of "signing." Do know, if you are accepting insurance that they may audit you and request to see you treatment notes. I would encourage you to keep your notes as brief as possible while fulfilling the basic requirements of what the insurance company will be looking for. Ideally, your EHR will allow you to keep separate "psychotherapy notes" which allows you to put in more personal details about your client that you would not want shared with insurance. I don't know about the other EHRs, but Simple Practice provides this feature. If your records are requested, you can simply download only the session notes, leaving the psychotherapy notes private. 13) Shape Your Online Presence. In today's world, people expect you to have a website. Personally, I love using my website as a way to store handouts and other resources that I would have needed to print out in the past. Making a website can be a fun and rewarding process. If you're feeling tech-phobic about it, just know that it's now as easy as creating a Power Point presentation. I There are multiple web tools that allow you to create your website content. My personal preference is for Weebly. It allows you to choose a template and get started quickly. You can create a free website that will have a "weebly.com" address. Once you ready to commit, you can buy a domain name (i.e. yourpracticename.com) and connect your Weebly site to that domain. There are many web registrars who sell domain names (e.g. GoDaddy, Google, Register.com.) Be wary of any that want to charge you more than $12/year. Google domains is a solid choice. Once you've registered your website, you can also create any number of e-mail addresses based on your website name (i.e. yourname@yourpracticename.com.) You could even have separate address for billing (i.e. billing@yourpracticename.com.) This is a fun step. It helps you feel like your practice is a really coming together. Outside of just your website, you'll want to be sure you're properly listed on all the search engines. You might also consider listing with one of the therapist referral websites. Personally, I didn't make that choice but many people do. If I were going to, I think I'd start with goodtherapy.org. Being enrolled with them allows you to access continuing education, unlimited, included in the price of your listing. There are lots of other options. Just search for "find a therapist" and see what pops up. 14) Design your Printed Materials. For me, one of the most fun parts of setting up my practice was making business cards and other printed materials. I've found that you can get really amazing deals through Vistaprint. The cards may not feel like the highest quality but they are very affordable. Zazzle also has affordable materials with more stylish options. Search for coupon codes, as both of these websites regularly offer discounts. Be wary of both Vistaprint and Zazzle's metallic or glitter options (Wait, what? It is just me who wants sparkly cards?) They aren't actually metallic or sparkly, but just the appearance of such (i.e. like a photo of metal would appear.) If you'd like some really high-end, printed materials, consider getting a sample pack from one of the companies that specializes in really unique printed goods like Print Peppermint. Print Peppermint, and other stores like it, offer real metallic printing on diverse materials, including things like cork and wood. You can get a little carried away with all the options. Maybe that's just me, but I found it to be the fun part of this process. 15) Consider a Giving Presentations to Referral Sources. One of your best marketing tools is simply developing a presentation on a topic and offering it to potential referral sources. Perhaps you excel at stress management. If so, maybe you could check with your local hospital to see if they'd like to learn about how their cardiac patients could learn how to relax. Or maybe you love working with eating disorders. You could consider giving a presentation at your nearest college counseling center. To get started, make a list of the type of clients that you most enjoy working with. Use that list to shape the professional identity that you want to market to others. Okay, so there are some of the major steps you'll need to set up a private practice. If you have questions, corrections or suggestions, just e-mail me a drwesch@drsarahwesch.com. Good luck!